Your body consists of about 60 trillion tiny batteries, which is what a cell is. These batterier generate their electrical charge via electrolytes, or minerals dissolved in solution. 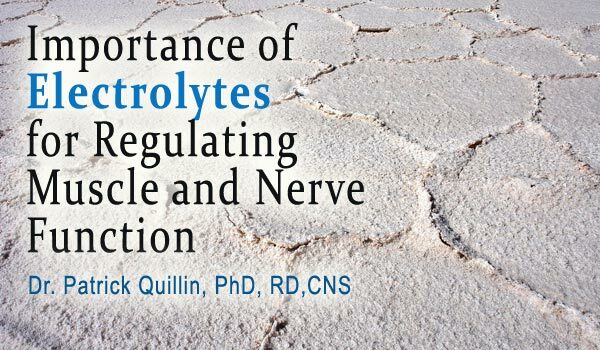 Electrolytes are vitally important for regulating muscle and nerve function. An electrolyte is composed of dissolved, electrically charged ions. The charge is either positive (+) or negative (-) depending on the type of ion. By delivering a small electrical charge across cells and through tissues, these ions help in cellular communication and ultimately aid in tissue and organ functions. However, for proper functioning of body tissues and organs, a critical ratio of electrolytes must be maintained. In the case of muscle and nerve functions, four electrolytes namely; sodium, potassium, magnesium and calcium are required. In order for this to happen according to the needs of the body or requirements of an individual, these electrolytes must be present in a particular ratio. In the event that the critical ratio of these electrolytes is thrown into disarray, muscle and nerve functions will be affected. When such an imbalance remains for an extended period, serious muscle and nerve problems can occur. When your electrolyte ratio falls within the above ranges, your muscles and nerves will normally carry out their functions satisfactorily. However, if the level of one or more of the electrolytes either falls below or rises above the normal range, you can get muscular and/ or nerve issues. While minute amounts of magnesium are required within the body, it is critical for more than 300 reactions in the body. In muscular and nervous functions, it helps to relax muscles, regulation of heart rhythms, and stimulation of the parasympathetic nervous system. Magnesium deficiency leads to cardiovascular conditions and muscular tension among others. Are you aware of the signs of magnesium deficiency? Calcium is required for muscle contractions and nerve signaling besides other functions in the rest of the body. Potassium is required for the maintenance of healthy blood pressure. It also helps to regulate heart contractions and muscle functions in general. Sodium helps in the regulation of body fluid balance. It is also involved in muscle contraction and nerve signaling. What Happens In Case Of Lower Or Higher Electrolyte Levels? It is worth to note that the critical ratio of these electrolytes is necessary for muscular and nervous functions. Whenever the level of any of them deviates outside the normal range, functions associated with it are affected. This leads to muscular or nervous malfunctions. Is your weight causing some of these symptoms? How is Electrolyte Imbalance Diagnosed? When your doctor suspects that you are suffering from electrolyte imbalance, he may order for some tests to help evaluate your electrolyte levels. The tests may only involve urine and blood. However, more advanced tests such as an electrocardiogram (EKG), ultrasound and X-rays may also be conducted to determine the extent of your condition. If you suspect you have electrolyte imbalance due to dehydration from activities such as exercise, manual work or even vomiting or diarrhea, you may only need to take some water or juice. However, if you suspect that you have serious electrolyte imbalance, you need to consult your doctor for testing and advice without delay. Note that long-term electrolyte imbalance can cause muscular cramping, twitching, spasms, blood pressure issues and heart palpitations among other conditions. Treating the problem early will reduce its negative impact and help you lead a normal life. If your doctor diagnoses electrolyte imbalance, he will oversee your treatment and give you any necessary advice. He will also recommend that you take electrolyte-rich foods and drinks. The first cause of treatment will be to find out the root cause. If it has been caused by dietary inadequacies, supplementation can do the trick. In cases of interference by medication, changing the culprit medications followed by supplementation can help to recover the critical ration of electrolytes for regulating muscle and nerve functions, among others. A daily intake of 8 glasses is recommended. This is, however, only an average and you may need to take more or less depending on factors such as your diet and daily activities. Remember that too much water dilutes your body fluids, which lowers electrolyte concentrations, while too little water intake raises electrolyte concentrations. If your electrolyte imbalance is a result of a medication that you are taking, your doctor can prescribe an alternative or recommend that you take electrolyte supplements. Remember that there are many sources of sodium and it is easy to eat too much. Cut down on salt by avoiding packaged foods and adding very little to your food. However, too little salt can create problems also, including elevated blood glucose. Salt and other electrolytes in the diet are like the Goldilock’s story, not too much, not too little, but just right. This is why we need salt in our diet. Depending on your electrolyte levels and the cause of imbalance, you may need to take electrolyte supplements to help regain balance. You can purchase supplements for various electrolytes, including, potassium, magnesium and calcium. It is important that you choose high quality supplements and to consult your doctor before taking them. Why We Need Salt in Our Diet?